New Zealand geology includes an extensive region of thermal activity in the central North Island, known worldwide as the "Wonderland Region". Rotorua city is located in this active thermal region and has geysers, boiling mud boils and hot water mineral springs. Rotorua Mud has become world renowned for its curative, therapeutic and cleaning properties and has been used for many years by Rotorua's Queen Elizabeth II Hospital for healing and therapeutic care. 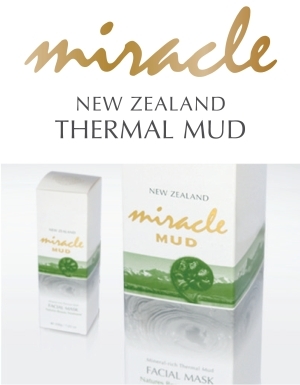 From this boiling mud and mineral-rich region of New Zealand, Pearson & Craig have developed a unique range of natural thermal-mineral skin care products under the name of Miracle Mud & Spa, and also Twins Skin Care. Both Miracle Mud and Twins products contain pure thermal feldspar mud which is made up of silica, oxides of aluminium, calcium ferric, sodium, potassium and other trace elements. This mineral rich thermal mud is dried, steralised and processed into fine powder to form a natural base for Miracle's and Twins' special range of thermal mud beauty products. Sorry, no products could be found for this category.